The British Navy had no set uniform for its ship's crews during our era of portrayal, but the styles of clothing were none the less very much the same, with the main focus being on functionality aboard ship. Deserter ads and period artwork indicate that the bulk of seaman serving on Royal Navy vessels were wearing some form of sailor’s, or short, jackets; linen shirts; long or “narrow” trousers. The men also, in most cases, are described as wearing stockings, felt hats, and handkerchiefs. 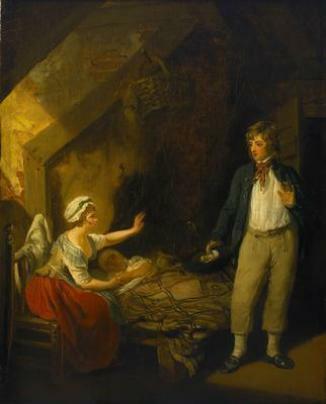 The best example of what we believe the typical Royal Navy sailor would be wearing is found in the painting "The Sailor's Return, 1779" seen below. 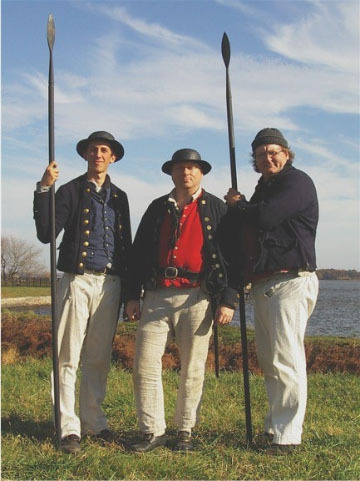 The Crew of HM Sloop OTTER will outfit itself as seen in the picture below. The requirements are listed in detail in our Sailor's manual, issued to each new member.